Free Standard Delivery. Enter code 040 at the checkout. Applies to a new customer's first order only. Expires 31/05/17. Excludes heavy items. 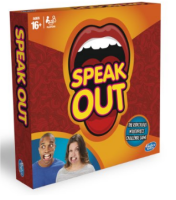 Child friendly version of Speak Out, it's got child and adult size mouthpieces and the phrases on the cards are also child appropriate! Where can I find Speak Out stock? Use our unique stock listings to locate stock as soon as it becomes available at our panel of top UK retailers. Our servers are constantly checking for stock to ensure you are the first to know when availability is found. During busy periods Speak Out stock can literally sell out in minutes, it is therefore crucial you know quickly when stock is available to buy before it sells out.